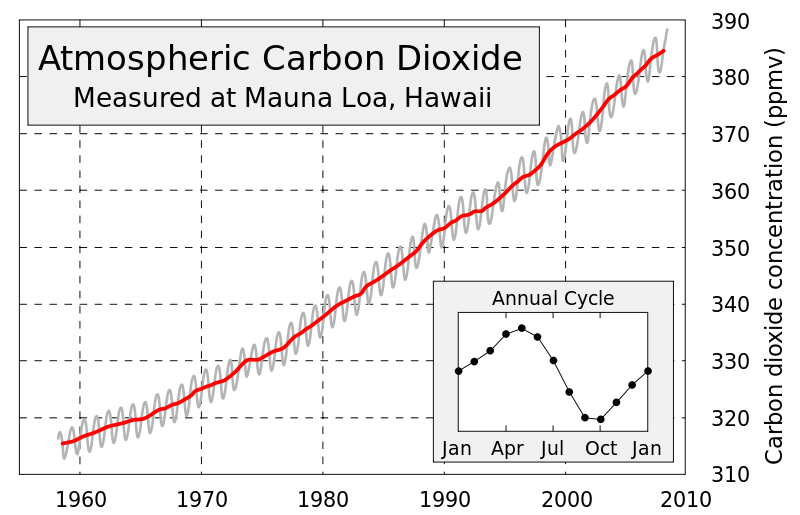 The Keeling Curve, a graph which shows how much carbon dioxide is in the atmosphere, indicates that the amount will exceed 400 parts per million (ppm) of CO2 very soon. The number, by itself, is not significantly different from 399ppm, which is where we are now, or 401ppm, where we will be soon enough. However, in context, it is a very important number. And it is important not just for climatologists, but also for those concerned with national and global security. It is part of an upward trend that is set to rapidly continue, and have severe long-term consequences. CO2 is a greenhouse gas that remains in the atmosphere for hundreds of years. So the numbers that come in today (monitored daily online) are likely to stick around for a while – barring an unforeseen Manhattan Project- scale technological advancement capable of scrubbing CO2 from the atmosphere on a massive scale (and we certainly can’t depend on that). The IPCC’s number for a somewhat safe amount is 350ppm, and the number to avoid exceeding is 450ppm. The current reading is worryingly close to the danger zone, and if emissions continue at the current rate, the world could reach the 450ppm mark “within a few decades,” according to geochemist Ralph Keeling. And we have not yet even experienced the full climatic changes that may result from existing CO2 emissions.Furthermore, given that these numbers are abstract numerical markers on the upward trajectory of global averages, they do not paint a picture of the differentiated impact of CO2 emissions across the globe – which depend on regional variances in climate and geography, as well as social, political and economic systems. In some places, the damage is already being done. The Arctic and Small Island Nations are already showing signs of significant change from sea ice melt and sea level rise. Recent studies have linked climate change to extreme drying in the Mediterranean, North Africa, the Middle East, as well as Russia, Central Asia, Australia and the United States. These changes are stirring up new geopolitical conditions, and contributing to the widespread loss of livelihoods in both fragile and developed nations across the globe. As CO2 increases, so do the potential risks to human societies. In some parts of the world, 400 may bring societies a step closer to instability. It is unprecedented in human history. While there is some mild debate over how many ppm are “too many,” whether or not we’ve already reached that level, or when we will reach it, one fact that cannot be disputed is that this is the first time in human history that there has been this level of CO2 in the atmosphere. And in fact, we passed that threshold a while ago. According to the IPCC’s 4th assessment report, the amount of atmospheric CO2 in 2005 (379 ppm) far exceeded the natural range of the past 650,000 years (180 to 300 ppm). We know with a very high degree of certainty the likelihood of climate change and its expected impacts. We know, for example, that the seas will rise, that 50% of the Earth’s population lives in coastal zones, and that by 2025 that number will rise to seventy-five percent. We know that global agriculture production faces increased floods and droughts, which will disrupt growing patterns that have been cultivated over thousands of years, severely diminishing our ability to feed a global population expected to reach 9 billion by 2050. We know that climate change will impact resource availability, such as freshwater, compelling people to move to new locations, within and across national boundaries. We know that such dynamics can result in conflict and violence. Despite the certainty of these risks, the global response has been feeble at best. In short, we were unprepared. Climate change at this rate and scale is unprecedented in human history. Our governance structures, from the familial to the international, which are responsible for responding to risk and maintaining our security, have evolved during a period of relative climate certainty. Cities, trade agreements, economies, national boundaries, political systems, security strategies, have all been built upon a stable climate. In a world with an unstable climate, all of these structures will have to prepare. An unprecedented risk needs an unprecedented response. By Caitlin Werrell and Francesco Femia in climate and security on May 7, 2013 .